For years we’ve been able to offer fishing on our stretches of the Orkla, and now we can even provide fishing on the Gaula. We have fixed beats which can be rented by the week for groups – with or without accommodation – and rotation fishing, which is growing in popularity. This lets you fish in pairs with a friend, rotating over several beats, giving you access to a wide variety of fishing. 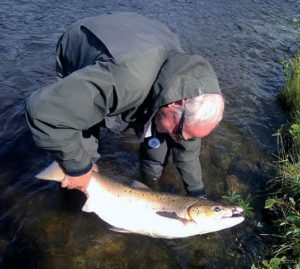 We can even offer groups their own rotation week, including full board, a personal chef and fishing guides. In other words – we can organise tailor-made packages to suit your fishing. You are welcome to get in touch with us, and you are invited to experience exciting salmon fishing at Orkla Salmon!